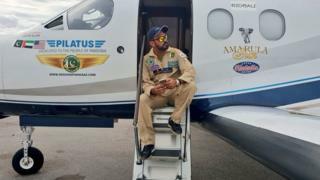 A former pop star aiming to be the first Pakistani to fly around the world in a light aircraft has landed in Karachi, six days after take-off. Sporting a khaki jumpsuit, Fakhr-e-Alam is piloting a single-engine plane emblazoned with his name. He is travelling with two experienced pilots on board, as he has less than 100 hours of flight experience. Alam has so far flown to cities in Europe, Africa and the Middle East. He now begins the Asia leg of his tour. He aims to end his trip, which he has named #MissionParwaaz, in Florida, where he took off from, next month. Alam has been posting frequent updates, photos and videos on his Twitter timeline. These have included details of the food he is eating, people he has met, and some stunning images of the cities he is flying over. Alam's trip has proved popular with Pakistani social media users, who have been following his frequent updates with interest. Many say his trip is bringing honour to the country, and have been calling for more recognition for him. He was greeted at Karachi airport by the governor of Sindh province, Imran Ismail. Addressing a press conference in Karachi, he said that he had felt "different" when entering Pakistani airspace. He will now make stops at Islamabad and Lahore, before continuing his onward journey via Bangladesh. Alam will not be making a stop in India. Citizens of India and Pakistan, which are historical rivals, find it difficult to obtain visas to visit each other's countries.